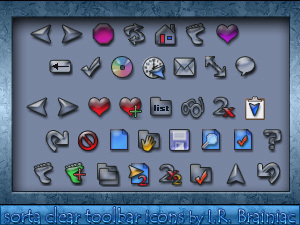 Toolbar icons that pick up most of their color from the background. (grey in this case)Fits nearly any WB. These are large only.Feel free to include these in your wb upload if you like. hey!.....I downloaded....but how do I install this toolbar icons?? dhaval_1920 ,double click them just like a wb.It will install itself in your toolbar section. name appears but no icons. Great looking Icons! Any way to use these as desktop icons?